The Hurlburt Field Preteen Outdoor Classroom is truly a unique classroom, being that it has been pushed to a new level of appreciation for nature with an older group of youth. These preteen youth, ranging in ages from 9-12 years old, have had a first hand in creating the areas for their space. This has really allowed for our youth to have a sense of ownership of their outdoor classroom. At Hurlburt, we have created a culture of loving the outdoors and wanting to spend time in it as well as nurturing and exploring it too. 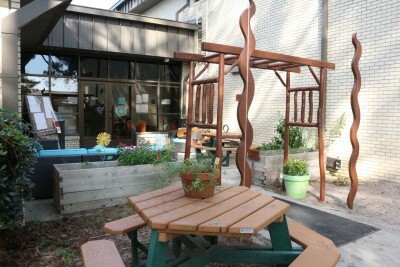 In our classroom, most of our structural pieces are made from natural wood such as our arbor archway, beehive, art easel with bench, and picnic table. A large variety of native plants and flowers are found throughout many of our areas with various shapes, sizes, colors, and textures. When you look up in our trees, wind chimes, custom-made tree figurines made by our youth, and light catchers brings added definition to the area as well as providing an extra dimension of visual sensory. Using trees as natural dividers help youth to understand the separated areas and help to keep materials organized. All areas have been designed to be low maintenance but are still open-ended to allow for full creativity of youths imagination. Natural wood signs placed at the entry of each area help to define the spaces even more. Keeping our plants, trees, and bushes trimmed and maintained is key to having clear visibility of all areas as staff is also strategically placed throughout the classroom, engaged with youth. Youth can be found engaged in a nature art project of painting flower pots, enjoying the peacefulness of working on homework in a hammock, testing their senses by climbing the beehive to see beyond our fence line, throwing a football in our large motor skills area, tending to and watering our plants, or simply enjoying raw exploration of different species found in our classroom. We have a great community of volunteers. From parent volunteers to active duty military members, each has contributed a great deal to helping us provide a safe, and enjoyable environment for our preteen youth. Arbor Day was a huge success when Patricia Williams, Natural and Cultural Resources Program Manager on Hurlburt Field helped youth plant two new trees in our Outdoor Classroom. 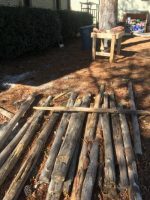 Our Preteen youth and staff dream big and are already thinking ahead of ways to continually improve and grow our classroom by adding even more dynamic areas for youth to continue to fall in love with nature.